Fleetwood Mac News: With Christine McVie's return, the Mac is back and better than ever. With Christine McVie's return, the Mac is back and better than ever. The rumors are indeed true: with Christine McVie's return, the Mac is back and better than ever. It's often said that the whole is greater than the sum of its parts. That age-old adage is particularly relevant in reference to rock bands that attempt to forge ahead and record or tour without a key member in tow; the results can be uneven or sub-standard at best. While Fleetwood Mac already had a lengthy catalog to their credit by the time they revamped their lineup and adopted more of a pop sound in the mid-1970's, the UK-spawned blues/rock group's greatest success came when the dynamics of all its different personalities meshed and translated into hit singles and million-selling albums. Fleetwood Mac reached unimaginable heights when breezy, laid-back Californians Stevie Nicks and Lindsey Buckingham were welcomed to the fold and the band debuted their new look, sound and feel to the world with a magnificent 1975 self-titled album. A major factor in the band's newly attained success was the emergence of veteran songwriter and vocalist Christine McVie. With her cool vocal delivery and impressive keyboard work, McVie's presence was as much a factor in the band's dominance of sales charts as Buckingham and Nicks. Christine dropped out of Fleetwood Mac in the late 1990s to enjoy a quiet, reserved retirement in her rural English estate, but on this latest tour (following a highly successful jaunt around the globe in 2013), she returned to the lineup after 17 years away, apparently having missed the rush of onstage performance and the camaraderie of touring with her bandmates. The constant ovations she received all night long at this past Saturday night's sold-out concert at Tampa's Amalie Arena proved the fans are more than a little pleased she's back. Opening the final night of the tour's first leg (the band resumes their North American trek in mid-January), the familiar quintet (with some assistance from a trio of backup singers and some additional musicians) hit the stage just after 8 and without the aid of any warm-up act, got things off to a rollicking start with "The Chain," a signature tune hat shows off the distinctive flavor each member brings to the table. Nicks's all-too-familiar instantly recognizable vocal acrobatics, Buckingham's exquisite guitar arrangements, John McVie's booming bass lines, Mick Fleetwood's solid drum work and Christine's subtle keyboard fills and wonderfully deep, breathy, cooing voice. The massive stage was bathed in stark blue lights as Nicks, a dynamic performer as either a solo artist or lead muse of the group, rocked and swayed from side to side clad in one of her traditional black dresses replete with fringe and lace at her perch front and center. Her long blond locks flowing, Nicks looked and sounded better than she has in years. Her loyal legion of fans tend to dress in look-alike outfits when attending her shows and Saturday night was no exception; scores of blond ladies sporting top hats, black boots and flowing lacy garments were easy to spot in the packed crowd. If there was one low point about the band's last visit to the area, it was the absence of all those great Christine McVie songs that were omitted from the set throughout their superb summer 2013 arena show. Welcome additions to Saturday's setlist included "Dreams," "Say You Love Me" and "Over My Head," all integral to the Mac singles canon and all McVie-led numbers. Whether standing at her bank of keys stage left or shaking a pair of maracas center stage or sporting a mini accordion, McVie's presence, comfort level and command of her gorgeous vocals seemed to come as naturally as ever. One would never know the striking 71-year old had been away from the stage for nearly two decades. Hits and lesser-known album cuts featured prominently throughout the lengthy 24-song setlist. Nicks had plenty of time to shine throughout her own fair share of mega-hits she's contributed throughout the band's tenure. There's a lot more to Stevie Nicks than eccentric costumes, inimitable and instantly recognizable vocal style and whimsical poetic lyrics — Stevie is a storyteller and a purveyor of positivity. Almost as engaging as her heartfelt readings of "Rhiannon" and "Dreams" were her rich, descriptive between-song chit-chat and anecdotes. Whether describing how visiting a funky San Francisco clothing boutique in the 1960s served as the inspiration for her 1982 hit "Gypsy" or humbly asserting the belief that any single person in attendance is capable of making their dreams come true as long as they don't let anyone stand in their way, it's clear why Nicks draws such a rabid, dedicated legion of fans and has done so for the better part of 40 years. For all the depth and hit power that Nicks and McVie emanated from the stage, it is truly singer-songwriter-guitar wizard Lindsey Buckingham who draws the mightiest and most awe-inspiring responses when he takes command of the spotlight. Delivering razor-sharp takes on his compositions "Second Hand News" and "I Know I'm Not Wrong," he sounded fantastic both vocally and through his incredibly unorthodox, unique guitar picking style. While he wowed the crowd plenty of times throughout the night, notably via his solo acoustic mind-melding and rather frantic take on "Big Love," the raucous standing ovation he received after the jaw-dropping, extended guitar gymnastics he displayed as he stomped from side to side of the massive stage during "I'm Not Afraid" summed up the love and affection the mostly 50-plus-aged audience still hold in their hearts for Fleetwood Mac and its individual members. 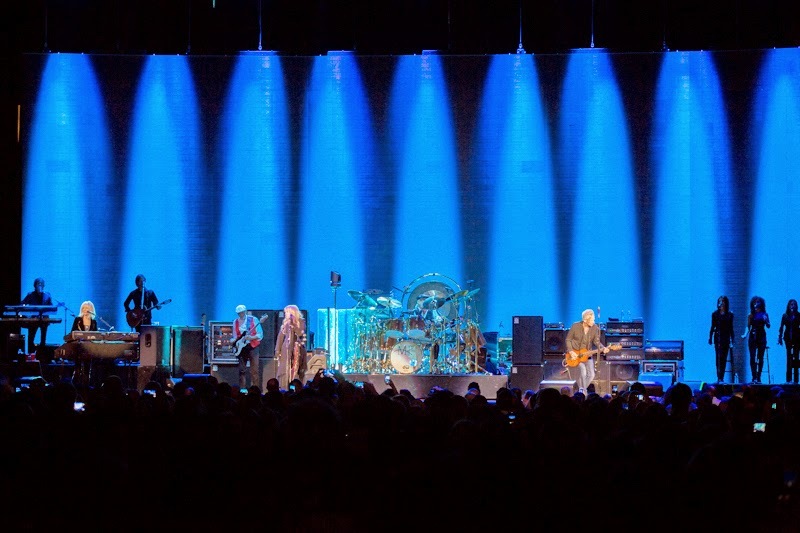 A massive screen at the rear of the stage sporting crystal-clear images was matched in clarity by the sweet, perfect, long-missed three-part harmonies Nicks, McVie and Buckingham shared all night. At no point were they more in sync, more beautifully layered or more impressive than in the band's most recognizable hit, "Don't Stop," which featured prominently during one of the night's encores. All three took turns alternating through their designated verses but the sound of them singing in unison on this joyous, inspiring tune really summed up the elation felt by their throng of long-time fans of having the most successful and treasured Mac lineup in history back together and on the road again. The nearly three-hour set (sans intermission) came to a poignant close with Christine McVie planted center stage, sitting behind a massive black grand piano and delicately delivering an absolutely gorgeous rendition of her tender ballad "Songbird," originally from the band's 1977 masterpiece Rumors, one of the best-selling albums of all time. How fitting that the woman whose return to the fold has been the main draw for this current tour closed the night and show off with the style and finesse that had long been missing. Wrapping up the night after the music had ended was Nicks and Mick Fleetwood each taking turns alone at the microphone conveying what it means to the band to have McVie back on board and delivering heartfelt words of thanks and appreciation to the fans who have attended the 40 shows leading up to this one, the final night of the current run. While it certainly would have been simple for a band as well-loved as Fleetwood Mac to deliver an abbreviated set of hits and not much else, they went out of their way to deliver a lengthy, exciting performance that seemed to please every single person who'd purchased a ticket. Casual fans and die-hards alike had to be pleased with the varied setlist and the individual contributions each and every band member brought to the nearly-three hour party.